Named a “Twitter Powerhouse” by The Huffington Post, Stephanie Carls shares her passion for social media and technology online and focuses on the ways both are changing the way we live and share information. Through engaging video content, she enjoys showing how to make sense of technology so you can tap and swipe your way to a simpler and more savvy life. Stephanie is the Client Success Manager with Rivet in Austin, Texas. She helps inspire and influence Rivet’s clients to gain measurable results in their content marketing strategy. • What is the best app for keeping track of purchases? • Is there an app for managing gift cards? • What’s the best app to manage productivity? • How can we get our apps to work together? • How can we share our photos offline? If you are new to Twitter Chats and not sure how to join in, simply log into Tweetchat.com and use the hashtag #MillennialTalk. You can then follow the flow of the conversation. Tweet me @ChelseaKrost w/ any questions about our chat or leave your comments below!!! 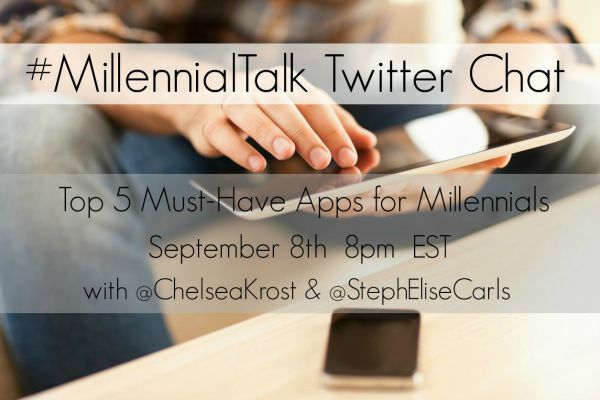 Looking forward to chatting with you tonight at 8 pm EST about “Top 5 Must Have Apps For Millennials” with @StephEliseCarls on #MillennialTalk.